The goal of this campaign is obvious: entice new customers to try http://www.airbnb.com, to generate additional revenue for the company. One way to increase revenue is by adding new customers to your existing client database. It’s simple: new customers = additional revenue. A secondary goal is to convert the new customers (promo/trial customers) to loyal customers after the promotion ends. Because the deal was announced via social media, it’s clear that the company is targeting consumers who frequent social media sites. I’m sure Airbnb has data that shows most customers discover the company via online search. social media, and word-of-mouth. It knows exactly where its target market is hanging out. Also, because it’s such a great deal, Airbnb benefits from free advertising when people share the deal with family and friends – there is a viral element to the ad because it’s such a great offer. This reduces marketing expenses and increases the ROI for Airbnb. Does the offer make me stop what I’m doing to learn more? Is the offer worth my time? Definitely. If you’re going to make an offer, make sure it not only makes sense financially but also gets people excited and gets people talking. I suspect Airbnb allocated part of its marketing budget to pay for the free offers that would be redeemed. It avoided the high costs of advertising the deal via traditional channels (print & TV), and instead relied on its current customers to spread the deal via social media. You needed to book your trip between January 13th and 17th, travel by March 31st, AND book for at least two nights (first night is on Airbnb). I’m sure the winter months are a slow time for Airbnb. This offer was an attempt to generate revenue during the slow months, while also hoping that some of the new clients will stick around and try Airbnb next time they travel. Is There a Way to Track Whether the Ad is Successful? Yes. You must enter promo code: ONENIGHT to redeem the offer. 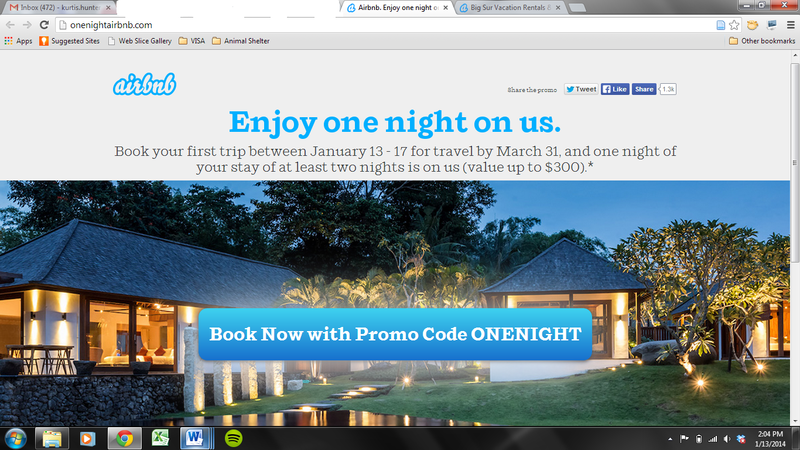 This promo code allows Airbnb to easily track how many people redeemed the offer. Airbnb can also determine how much revenue was created by not only this offer but also any future business from the customers acquired during this campaign. Armed with this data, Airbnb can adjust future marketing campaigns to maximize return-on-investment (ROI). How Can You Apply Some of the Lessons from This Airbnb Marketing Campaign? Before you create advertisements and marketing campaigns, you should always determine the goal of the marketing campaign. Is it to create brand awareness? Is it to acquire new customers? Is it to reward existing customers? Also, take time to crystallize your target market. So many marketing campaigns fail because companies fail to clearly define the target market. Who are the people we are targeting with this marketing campaign? Does our ad/message resonate with the target market? Are we marketing our product/service where the target market hangs out? Is there a clear call-to-action? What do you want the target market to do after they view your advertisement? Is the offer irresistible? Is there a deadline to redeem the offer? What happens AFTER they take advantage of your promotional offer? How do you follow up to ensure the new customer(s) become lifelong customers? A successful customer acquisition campaign includes: a goal, a defined target market, an irresistible offer, a clear call-to-action, and systems to convert new customers to lifelong customers. ← Are You Making the Same Marketing and Sales Mistakes as My Local Gym? Thank you for the reference. Loved your Airbnb article.